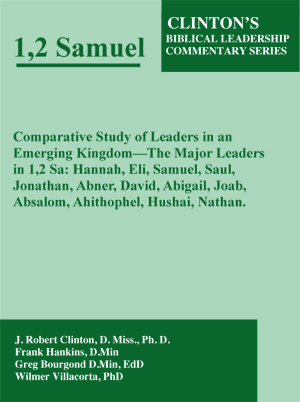 Comparative Study of Leaders in an Emerging Kingdom—The Major Leaders in 1,2 Sa: Hannah, Eli, Samuel, Saul, Jonathan, Abner, David, Abigail, Joab, Absalom, Ahithophel, Hushai, Nathan. This 630 page commentary (PDF file) is one of a series of Biblical leadership commentaries. This series explores the most relevant books of the Bible for leadership findings. The leadership commentary on 1,2 Samuel involves an overview of 1.2 Samuel, i.e. a recognition of the contribution of 1.2 Samuel to the whole Bible. It then follows with the identification of 15 important leadership topics/lessons. Then there is the actual leadership comments on the 13 leaders’ vignettes or Bible Units— Hannah (2 Vignettes), Eli (8 Vignettes), Samuel (19 Vignettes), Saul (23 Vignettes), Jonathan (10 Vignettes), Abner (13 Bible Units), David (22 Vignettes), Abigail (12 Bible Units), Joab (12 Vignettes), Absalom (12 Vignettes), Ahithophel (10 Bible Units), Hushai (7 Bible Units), and Nathan (18 Bible Units). Finally there are 85 leadership articles totaling 447 pages describing various aspects of leadership seen in each of the 13 leaders. Included in these 85 leadership articles is a biographical sketch article for each of the 13 leaders listed in the title. A 22 page Glossary of leadership terms follows the leadership articles.